Wilfred Ndidi played for all 90 minutes as Leicester secured their third straight win in all competitions. 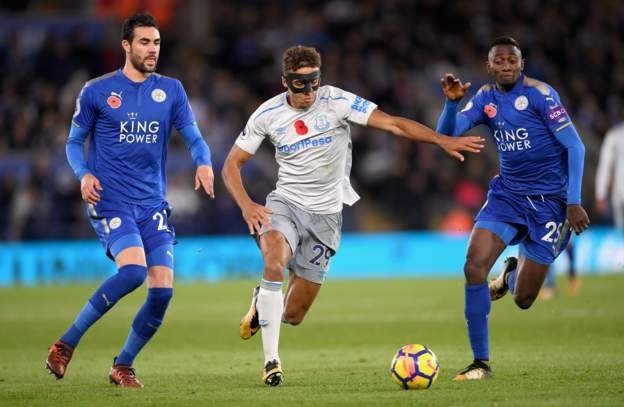 Super Eagles midfielder Wilfred Ndidi played from start to finish in Leicester City’s 2-0 victory over Everton on Sunday. Leicester secured their third straight win in all competitions in a game compatriot, Kelechi Iheanacho came on in the 90th minute for Jamie Vardy who scored the first goal. Leicester City went ahead after 18 minutes and the goal came after an Everton set-piece was easily cleared to Demarai Gray who bundled past Tom Davies before going past two more challenges and spotting Riyad Mahrez to cross for Vardy who finished from close range. The Foxes extended their lead 11 minutes later when Demarai Gray’s shot was deflected into the net by Jonjoe Kenny. The win takes Leicester City from 15th to 11th place on the English Premier League table.